Consulting is a tough job. You work long hours. And at times sacrifice other parts of your life. I remember when I started at McKinsey, my social life and any hope of playing sport went on hold; there just wasn’t time when spending 70-80 hours working Monday to Friday. However, what always amazed me was how little correlation there was between hours worked and value added to the client. In fact, upon reflection, the largest correlation was with how secure (read near promotion) the various levels of leadership were. It became my only staffing rule: never join a team where the client lead is on the verge of designation to Partner! If leaving your job is ever in contemplation, read this article to find out the pros and cons financially. Without a doubt, the most important facet in controlling your lifestyle is agreeing on team norms. Let the team know what’s important to you. This will, of course, vary a lot by team member: some will have children, others will have just left university and want to continue sport, etc. What’s critical is that everyone agrees on a working pattern, and has some non-negotiable time-off. I’ve seen these things work really well with new parents who went home early and took 5-7pm off, before coming online later. It worked equally well with people taking an evening in the week where they always stopped at a certain time (e.g., to go to training). Agree your norms up-front, and make them non-negotiable. In the words of Rudyard Kipling, “If you can keep your head when all about you / Are losing theirs and blaming it on you- you’ll be a Man, my son”. Does the client really need an appendix of 250 pages, or would it be better to sit with them for 2 hours and talk them through the analysis, so they can access it themselves? Do you need 50-page decks to go through every time you meet with the senior client, or would they prefer to have a more open discussion earlier in the project? This really is within your gift. The leadership don’t want “yes” people, they want someone to tell them what’s going to add the most value. Don’t forget, you’re in a privileged position of being far closer to the client than the leadership team – you’re in there day in, day out. As much as I’d like to blame others around me for the long hours, some responsibility definitely lies with me. There are lots of resources on being more productive, but the best advice I received was very simple: do the tasks you really don’t want to do first. Simple, yet effective! My other golden rule was to never work a weekend. I was reluctant to put this in there, as it should be a given. However, looking at how many of my colleagues worked some part of the weekend, very regularly, I felt I couldn’t leave it out. If you’re struggling to keep the weekend free, try to block out the final 2 hours of Friday to come up with a to-do list for the next week. Psychologists have found that the happiest people are those that take the most holidays. The great thing about consulting is this really isn’t hard: between projects, no-one cares if you’re taking holidays. To be honest, it’s all the better for them as your utilisation isn’t going down. So don’t leave holiday allowance begging- take a break. Have a read of one of our more in-depth articles about Holidays here. Finally, if work really is getting in the way of life – it might be time to leave. You wouldn’t be alone; one of the most common reasons we hear people want to leave is to improve their lifestyle. Read this article to find out what industries and functions are most popular amongst consultants. 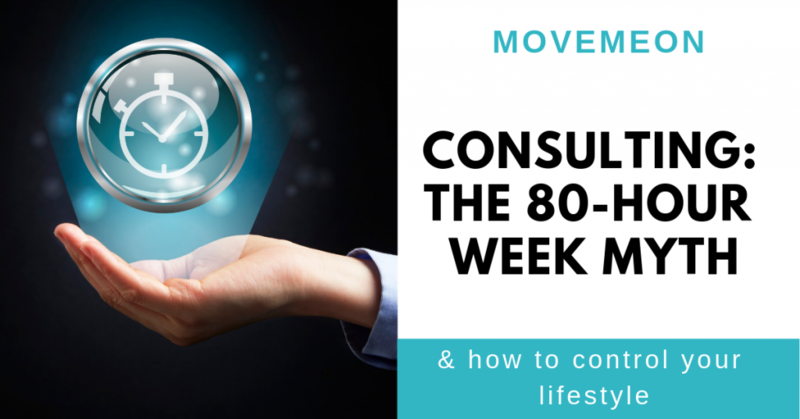 If you like all the other aspects of consulting work, but just want a bit more control on lifestyle, there are plenty of boutiques who offer just that. In fact, there are a few roles live on movemeon at the moment.